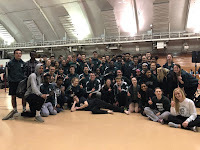 Tuesday (& Wednesday) night brought together the Big Eight Conference to compete for conference championships in individual events, relays, and overall team competition. This meet represents the most difficult competition we see all season long outside of the state meet in two weeks. The Madison Memorial Spartans represented themselves very well in both in the boys and girls competitions. The boys finished in 3rd place with 90 points behind conference champions Middleton with 148 points and runner ups Madison LaFollette with 113 points. The girls finished in a tie for 5th place with 63 points behind conference champions Sun Prairie 144.5 points and runner ups Middleton 134.5 points. This is a great finish by both squads at this meet and we look forward to our girls jv and our boys frosh/soph continuing this success on Thursday. BOYS - Daurice F in the 110m hurdles (14.96), 300m hurdles (40.49), & long jump (21' 3"), Jester W in the 100m dash (10.81) & 200m dash (21.99 - NEW SCHOOL RECORD & TIES CONFERENCE RECORD), and the 4x400m relay of Daurice F, Josh P, Nick M, & Jester W (3:27.75). Also scoring points and earning medals with their top 8 finishes were: Corinne F 2nd in shot put (37' 9 3/4'), Marissa H 3rd in the 100m dash (13.08), Sienna C 4th in the 3200m run (11:42.44) & 5th in the 1600m run (5:28.19), Meghan S 5th in the 800m run (2:28.22), Mariah OF 5th in the 300m hurdles (50.68) & 6th in 100m hurdles (17.92), 4x100m relay in 5th place (52.70), 4x400m relay in 6th place (4:22.40), Sydney S 8th in the 400m dash (1:03.25), and 4x800m relay in 8th place (10:59.75) for the girls. On the boys side we had Jonah W 2nd in the 3200m run (9:43.53) & 7th in the 1600m run (4:30.31), Nick M 2nd in the 300m hurdles (41.02), Josh P 4th in the 400m dash (51.54) & 7th in the 800m run (1:59.76), 4x800m relay in 6th place (8:35.21), and Jake A 7th in the 100m dash (11.93). Our focus now turns to Regionals on Monday and qualifying for Sectionals. Regionals will be hosted at Middleton and the top 4 finishers will qualify for Sectionals to be hosted at Mansfield Stadium. We encourage everyone to come out and support your varsity teammates in their pursuit of qualifying for the WIAA State Championships.